JSE Surplus makes their impact! 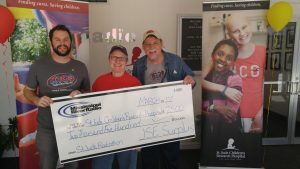 JSE Surplus contributes a total of $2,500 to the 2017 Radiothon! JSE Surplus is also our Phone Bank Sponsor this year! Thanks to them, we have volunteers waiting to make pharmacy you a Partner in Hope! ‹ Tri Deltas showing some love for St. Jude! › Final Total!